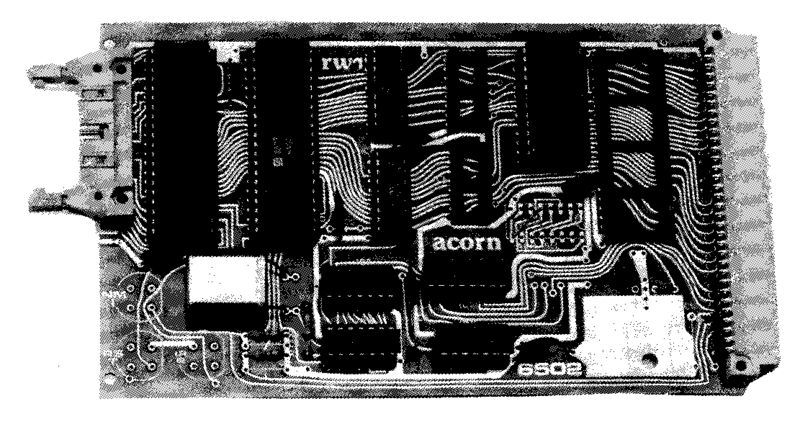 This Acorn Eurocard (100 x 160 mm) single board microcontroller is based on the 6502 processor. The standard controller is provided with 6502, 128 bytes of RAM, 16 lines of i/o, capacitor controlled clock and address decoding and logic. This board also has provision for up to four and a half kilobytes of ROM, 1 K bytes of RAM (2114) and 32 lines of i/o (two x 8154); a crystal controlled clock is also optional. The processor used employs pipelining giving fast execution times (4µs for load accumulator, 6µs for jump to subroutine and 2µs for internal register operations). The i/o device used is the INS8154 whose sixteen lines are single bit addressable, can be individually configured and are TTL compatible. A hand shake mode is provided facilitating asynchronous data transfer at a high speed, and direct interface to peripherals. A wide variety of memory i/o configurations can be selected by wire links in the address select socket on board. 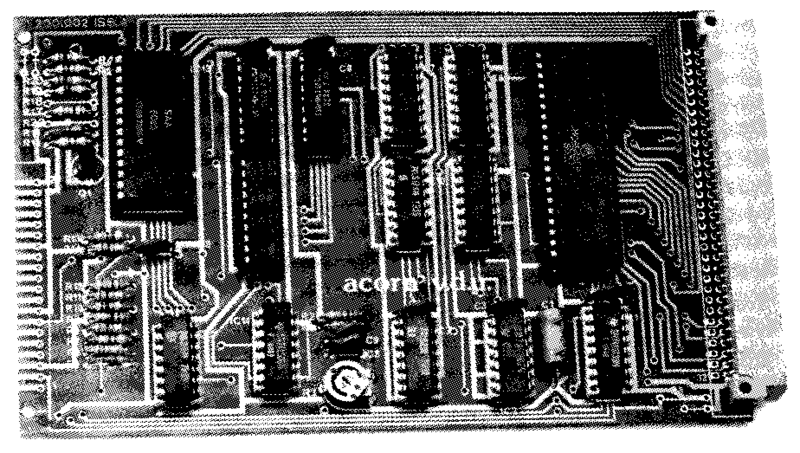 This board with the crystal controlled clock and other options becomes the 6502 CPU in the Acorn systems 1, 2, 3 and 4. The standard Eurocard edge connector carries the address and databus, eight control lines, sixteen i/o lines, the single DC supply rail and 5V regulated output from the on board regulator. The opposite end of the card has 16 i/o lines, two control lines and 5V output. 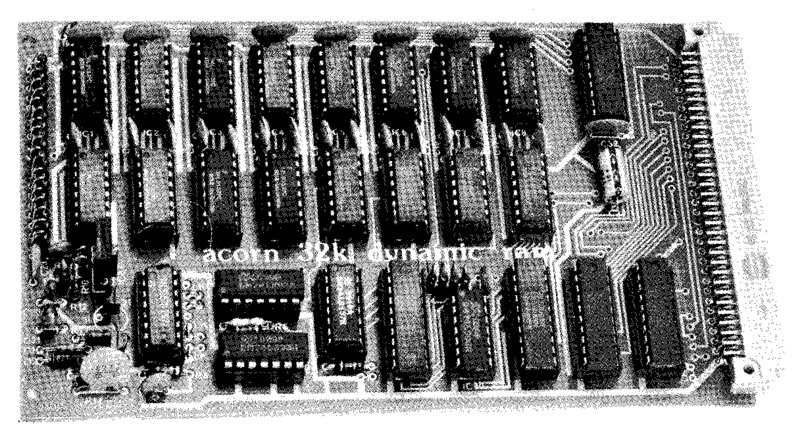 The 6502 CPU is designed for use in the Acorn system 2, 3 and 4 and it plugs onto the standard Acorn 8 or 14 slot backplanes. 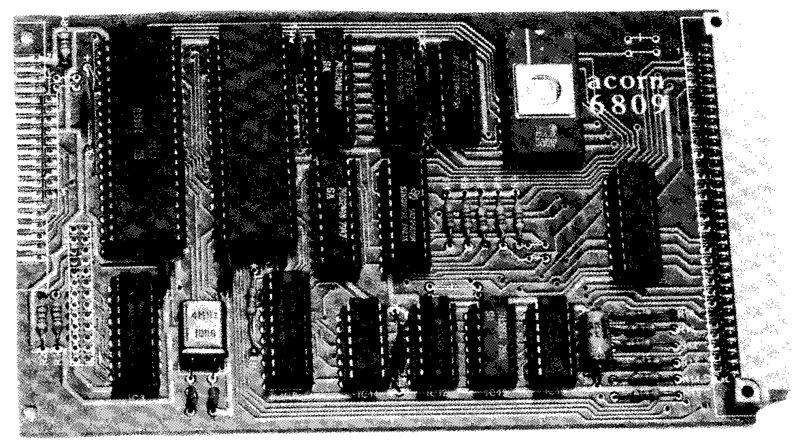 The 6502 microprocessor is run from a 1 MHz crystal-controlled clock and a TTL device provides address decoding. 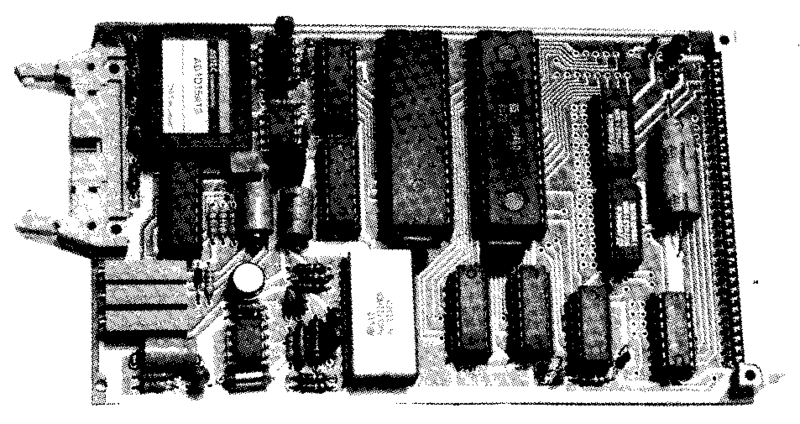 On the card is 1K byte of static RAM in 2114s and an 8154 i/o device provides 16 i/o lines, 8 of which connect to an ASCII keyboard via a 20-way ribbon cable connector. Other lines on the 8154 can connect to the cassette interface via the the backplane. A second 8154 can be fitted giving a further 16 i/o lines on the 64-way connector and a ROM can also be added to carry the Operating System software. (Alternatively this can be on a static RAM card, or CU-MEM). For spare chips see separate list. The upper Eurocard of the system 1 is available without keypad and display when it performs as a cassette interface card in system 2. It may also be added to systems 3 and 4 if desired. The Computer Users Tape Standard (CUTS) frequency-modulates data on to a standard audio cassette recorder with two tone system in which 2.4 kHz represents a logic 1 and 1.2 kHz a logic 0. This Eurocard (100 x 160 mm) is a plug-in replacement for the 6502 CPU card to upgrade Acorn Systems 3 and 4 to use the advanced facilities of Motorola's 6809 8-bit processor and is ideally suited to run high-level languages such as Pascal. The Acorn 6809 is provided with an operating system in 2K which handles the Acorn VDU, ASCII encoded keyboard and printer; it is readily expanded and very user friendly. DIN standard indirect edge connector. 20-way and 26-way IDC connectors for keyboard and printer. 2K ROM (initially 2716) 4K and 8K compatible. BIPOLAR PROM for address decoding. 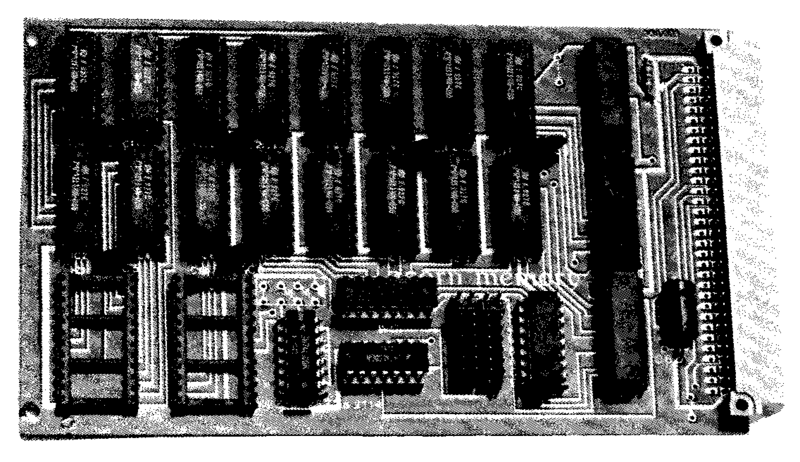 6522 two ten bit parallel i/o port for keyboard and printer. Random logic devices for address decoding. The Acorn 6809 is provided with a User's manual which describes how to use the monitors commands, and includes programming examples. An international standard disk operating system, called FLEX, is available to run with this card. This system allows the user access to disk files on a system 3 or system 4, and to buy standard software from software houses to run under FLEX. This Eurocard offers 8K of static RAM plus two sockets which each can accept a 4K ROM or EPROM. The 8K RAM bank and the 8K ROM bank can be independently located in memory to commence in 8K intervals throughout the memory map, e.g. each may commence at hex 0, 2000, 4000 etc, though to F000. 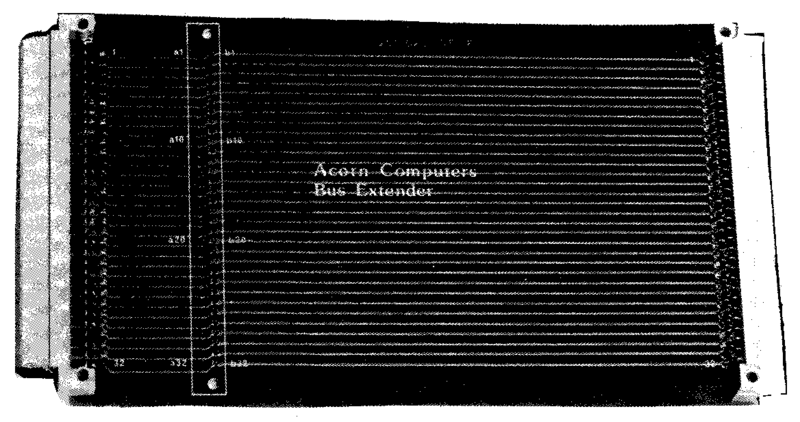 This Eurocard provides 32768 bytes of Random Access Memory for a computer system using the Acorn standard data bus. 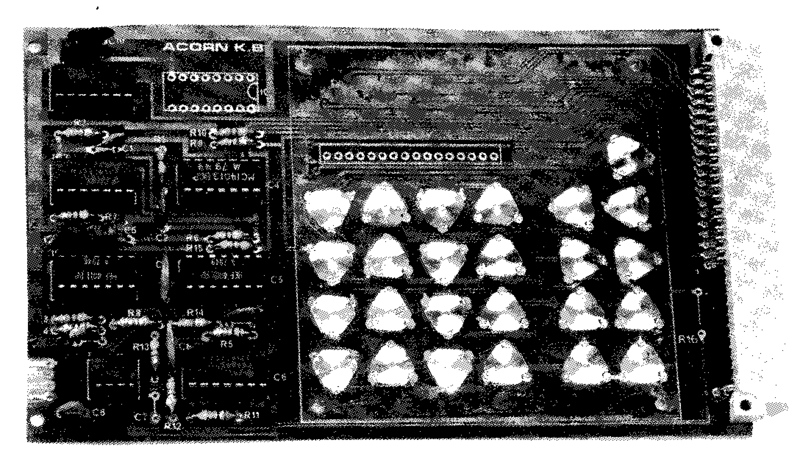 Such systems include any Acorn or Control Universal (CUBIT range) computer, or a computer using the Acorn bus as an expansion bus, as achieved with the Rockwell AIM 65 using the CUBIT extension system. The devices used are 5V-only 16K bit dynamic RAMs organised as two banks of 16K bytes. Timing is generated in synchronism with the 1MHz CPU clock and the hardware refresh circuitry allows random access of the memory in any clock cycle. The RAM is organised into four sections each of which is 8K bytes. These four sections can each be linked to begin at hex addresses 0, 2000, 4000, 6000, 8000, C000 and E000. In Acorn systems 2, 3 and 4 the card will usually be used to provide 8K bytes of program space at C000 to DFFF and 24K bytes of text space at 2000 to 7FFF. A 16K byte card can then be used to fill the remaining space from 8000 to BFFF is required. The Acorn Dynamic RAM cards can be freely mixed with static RAM cards and they can be paged if wished. 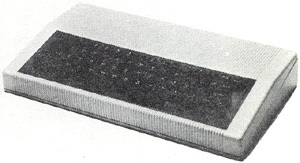 The Acorn keyboard uses high-quality 62 key mechanism. The keyboard encoder circuit has a 2 key rollover feature enabling fast typing speeds. ASCII is a 7-bit code for up to 128 characters and the keyboard outputs this code in parallel in seven signal lines at TTL level (TTL logic 0, +5V logic 1). A single +5V supply at 80 mA is required to run the keyboard. 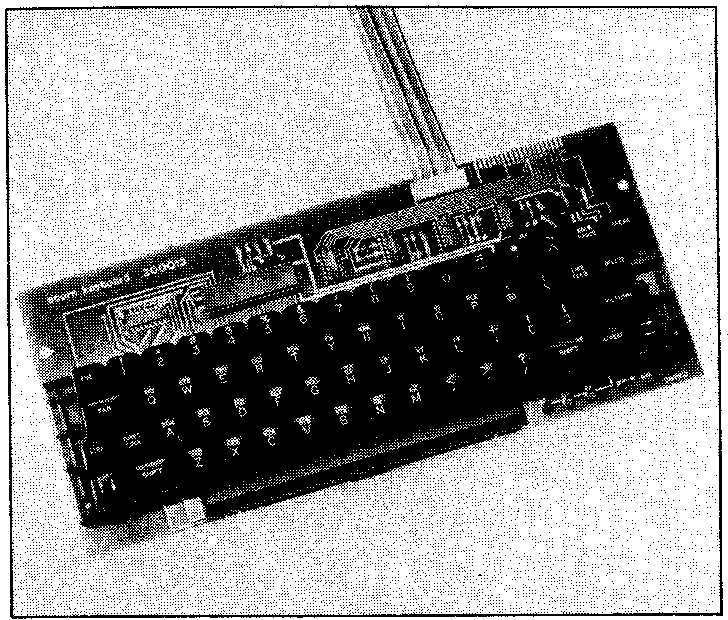 All connections to the keyboard are normally via a 20-way flat ribbon cable which connects straight to Acorn computer sytems, using either 6502 or 6809 processors. On the keyboard are some special function keys. Two of them connect straight to the output connector on individual signal lines giving a logic 0 when pressed. One may be used to reset the computer (break) and the other can be connected to an input port on the computer for examination by the users own software. Two other keys, control and shift, change the character set produced by the keyboard encoder to give ASCII control characters and upper/lower case selection. There is a shift lock key and another key locks the keyboard into a TTY caps mode (Teletype capitals). Three LEDs on the circuit board indicate TTY caps mode, shift mode and power on. 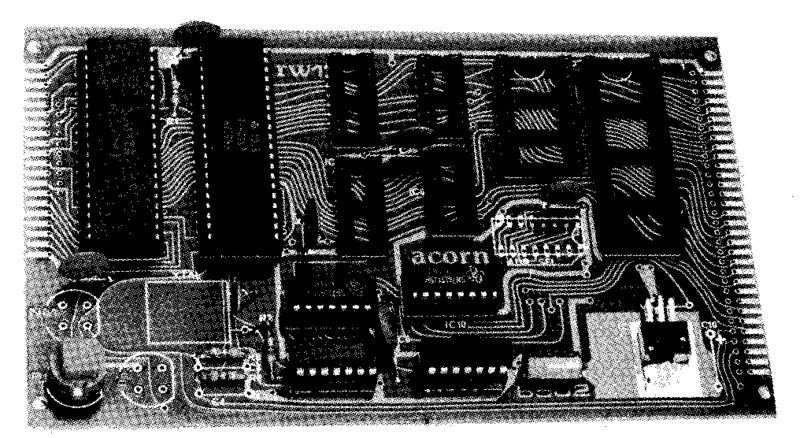 The Visual Display Unit Controller board connects to the standard Acorn bus, as used by Acorn Eurocard products and CUBIT computers and bus extensions. It provides a TV display for all such systems with 1K of RAM memory mapped on the host computer data bus. Text and Teletext graphics are transparently written onto the screen by the CPU. The intelligent device is a 6845 VDU controller which provides all the synchronisation signals to drive a 625 line 50 fields per second VDU, together with refresh addresses for the character RAM. Characters are then fed to an SAA5050 character generator which produces the necessary dot patterns to create the characters to refresh the VDU. The SAA5050 produces teletext characters and special effects (such as flash and double height) and has Red Green and Blue drive outputs giving coloured text and graphics. The card will drive a monchrome or colour TV monitor directly via RGB or composite signals, plus sync, or via an encoder and modulator will drive colour TV. In monochrome, colours appears as shades of grey. The technical manual supplied with the card has listings of a software driver for 6502 processor. When this card is supplied in a system, the software drivers are incorporated in the operating system. 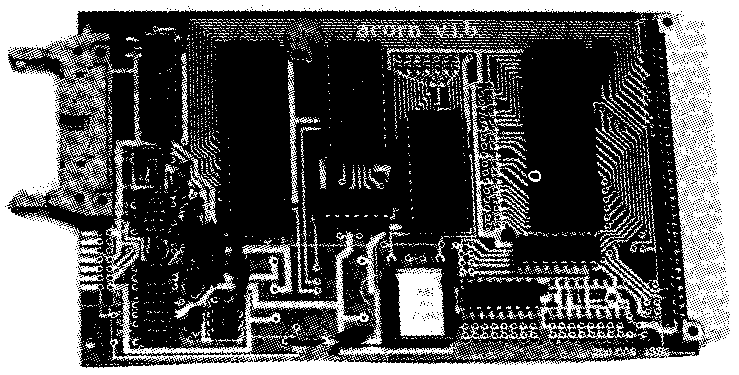 The VDU interface is a 100 x 160mm Eurocard which connects via a 64-way plug and socket to the standard Acorn computer bus. It produces a 1-volt composite signal which drives the 75 ohm input on a monitor. The screen is mapped to a 2K byte area of memory which usually resides at locations 1000 to 17FF (hex). An MC6845 programmable controller IC provides the addresses for the screen memory, and the horizontal and vertical sync signals. Access to the screen memory is transparent with either a 1 MHz or a 2 MHz CPU clock. A character generator RC1 contains the full ASCII character set, and also produces recognisable symbols on the screen for many of the control codes. If required special character sets may be obtained by fitting a user-programmed 2716 EPROM. A 12 MHz dot clock is used to serialise the data from the character generator ROM and this is then fed to a video amplifier which provides a composite video output from the card. The high 12 MHz data rate used to produced 80 characters on a line may be unsuitable for UHF modulator applications, and in order to view the 80 x 25 screen monitor diagonal of 10 inches or more will normally be required. Software to drive the 80 x 25 VDU is contained within special versions of the systems 3 and 4 operating system ROMs. 12 bit Digital to Analog converters; fully buffered with BI-FET OP AMPS, giving output voltages in the range -5.12V to +5.11V with a resolution of 2.5mV. 12 bit Analog to Digital converter, with eight channel analogue multiplexer and sample and hold circuit. Input voltage range -5.12V to +5.11V, resolution 2.5mV. Precision voltage reference (10.24V) removing any need for range adjustment or calibration on the ADC or the DACs. Versatile interface adapter. Controls the ADC enabling software programble conversion rate using internal timers and full interrupt control of the analogue system. The board also has a single bit digital input and output signal, enabling a storage oscilloscope or X-Y recorder to be driven directly by the analogue outputs using the digital output for the z axis (beam on/off or pen down/up and the input for the interrupt control. 12 bit up to 10,000 conversion/sec. 8/10 bit up to 25,000 conversion/sec. 8 analogue inputs, 2 analogue outputs at -5.12V to +5.11V. All interleaved with reference ground lines. Not available in kit form. The laboratory interface is designed for use on the standard Acorn Data Bus and provides 16 optically-isolated connections each of which may function as input or output to the computer system. A remote circuit board with 16 semiconductor switches and LED indicators may be connected by up to 25 metres of 40-way flat ribbon cable to the Eurocard. The remote circuit board has 16 connections each of which is set to input or output using a switch. In its output mode each connection can drive loads drawing current at up to 3A each from the remote supply DC voltage which may be in the range 6 to 48V. A catching diode on each output allows inductive loads to be used. In input mode each connection is driven by contact closures to remote supply common. An LED indicates the state of each connection in input or output mode. The remote supply voltage is optically isolated from the Acorn system on the interface Eurocard giving the computer immunity to electrical noise generated by the load switching. Noise produced by other equipment at the remote station is also isolated and ground loop problem encountered in the laboratory enviroment are eliminated. The remote supply can be different to the computer 0 volt line by as much as 48V peak. This Eurocard (100 x 160 mm) connects to the standard Acorn bus and provides an interface to one or two drives. It is capable of controlling four drive surfaces on two double sided drives. Single or double track density drives may be used. A 34-way flat ribbon connects to the drives after the Shugart interface standard. The intelligent device used is the Intel 8271. A number of disk operating systems are available for use in various systems. For details of Disk Operating Systems and disk accessories, see section on Disk Drives and Accessories, page 2.14. 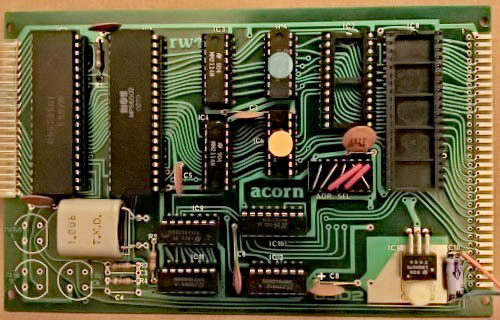 This board conects to the standard Acorn bus and may be used to program bipolar PROMs of the 74S571 type and PROMs types 2758, 2516, 2716 and 2532 i.e. 5V only 1K, 2K and 4K byte devices. 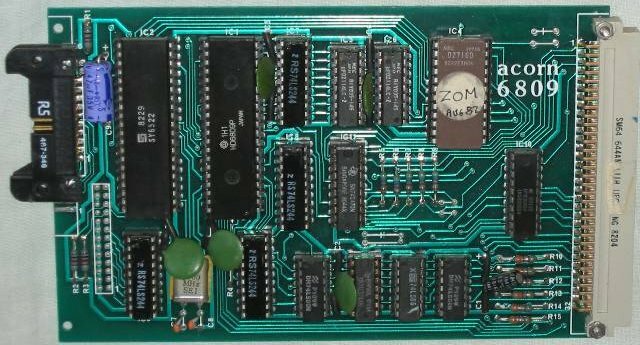 A tecnical manual is supplied with the board which includes an assembly listing of a 1.5 K byte program allowing device type selection, copying of a ROM's contents into RAM, verification of a ROM contents against RAM and the blowing of a ROM to match the RAMs contents. A cyclic redundancy check is performed on ROM giving a signature identifying ROM data. The program requires that a Acorn Operating system 2, 3 or 4 type, or CUBOS is present. 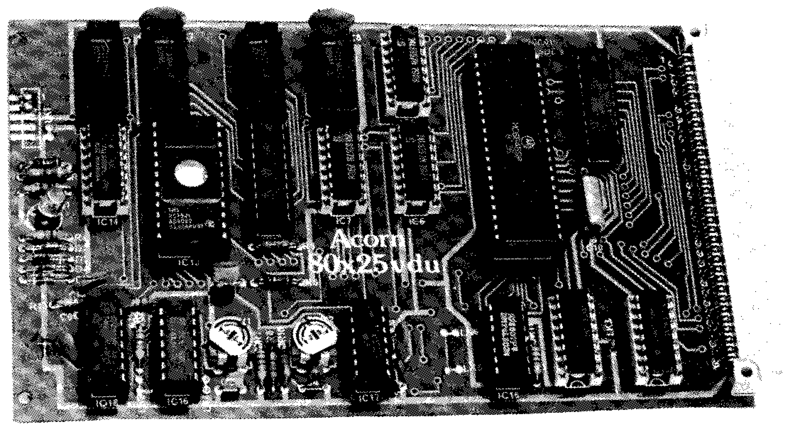 The programing board is longer than the usual Acorn Eurocard so that the two low insertion force ROM sockets are accessible from the front of the system. If desired this extra piece of board can be removed and connections to sockets on a remote panel can be made. A +12V supply is required for 74S571 devices and a +26V supply is required for the EPROMS. Power supplies for Control Universal and Acorn rack mounted systems supplied by Control Universal come complete with the necessary +26V supply. 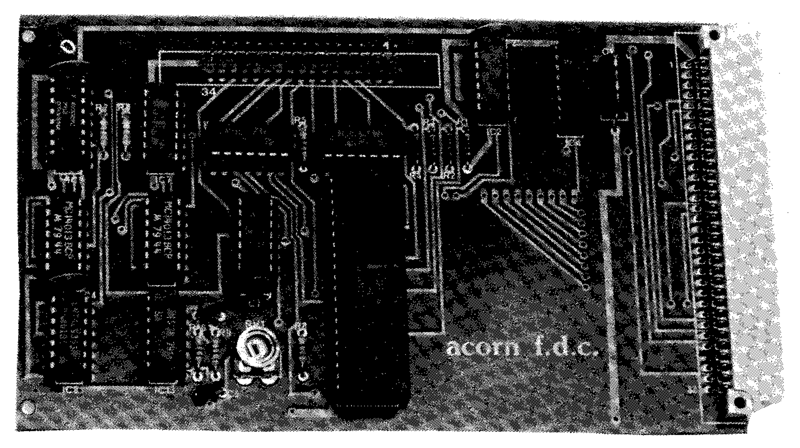 This board connects to the standard Acorn bus and provides interfaces via the three integrated circuits listed below. This device has two i/o ports which are each ten-bit parallel, TTL level (ie. 8 individually programmable data bits plus 2 control bits) and a pair of interval timers for providing real time interrupts. One port connects to side B of the bus connector, the other via a high current buffer to the front of the board, where a 26-way connector may be fitted. This connector is pin compatible with Centronics, Anadex and other printers. Provides three eight-bit ports, two of which can be programed to be all output or all input, and one can have direction programmed in two groups of 4 bits. This device provides serial interfacing together with an MC14411 bit rate generator IC and a 1.8432 MHz crystal which enable standard baud rates in the range 75 to 9600 baud to be selected. Edge connectors on the front of the board provide a 2OmA teletype connection and a RS232C connection. The 2OmA serial input is via an optical isolator giving ground isolation between interconnected Acorn systems. The RS232C interface requires a ±12 volt supply which may be either connected via the front edge connector or can be provided by an optional on board 5V to ±12V converter module. The Acorn Bus Extender is a Eurocard (100mm x 160mm) which plugs into any backplane plug using the DIN 64-way two row a/b socket. This brings the 64 connections to the front of the Eurocard rack where a socket projects out. Any other Eurocard can then be plugged into the extender card, leaving the &trocard clear of the rack for easy access, allowing it to be serviced or developed while operating in the system. 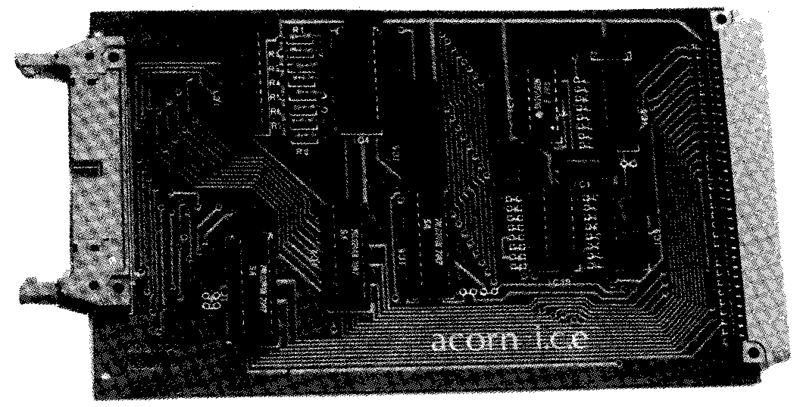 The In-Circuit emulator (ICE) allows a computer system employing the standard Acorn data bus to connect to a second microprocessor target system by way of its processor chip socket. Once established this connection may be used to test hardware and to evaluate software in the target system. The ICE is extremely useful in the development of new microprocessor products and in the test and repair of existing equipment. The ICE hardware is carried on a single Eurocard (160mm x 100mm) which connects to the standard Acorn system bus. A 40-way flat ribbon plugs into the front of the ICE and provides connection to the 40-way dual in-line plug for the target processor socket. In operation the the ICE relocates any two blocks in the target system to appear as blocks A and B in the host system. The selection of the two blocks is achieved by writing to the ICE control register which is a latch on the ICE card. After setting the control register any read or write operations by the host system to its blocks A or B are sent down the ICE cable into the target system. In this way the target system hardware may be accessed for testing with the same bus timing as would appear from its own processor. As the block selection is under software control programs for testing the target hardware can dynamically relocate the whole of the target memory map to be tested. The ICE is principally designed for use with the 6502 processor. The ICE 6809/6802 adaptor allows the ICE to be used with a target system designed for either the 6802 or the 6809 processors. This may be done regardless of the type of processor in the host sytem, as the purpose of the ICE is to make memory areas in the target system available to the host system for reading and writing.